As I was learning React, I’m sure I wasn’t the first to paste some ES5-style React syntax into an app using ES6 and get into a complete mess. Once you’ve got to the point of recognizing the differences, it becomes more obvious which is which and becomes easier to spot an older (and possibly out of date) article with a newer, up-to-date article. I like to build example apps to help me understand what’s going on with any new tech or framework, so I thought it would be useful to build the same app twice — once using React with ES5 and then rebuild it with React and ES6 as a comparison. Here’s a rundown of the differences and similarities (I’m sure there are others, too, but these are the ones I’m familiar with). Now, let's look at the AppContainer component. Defines component state using getInitialState(). Exports the component as a module using module.exports. 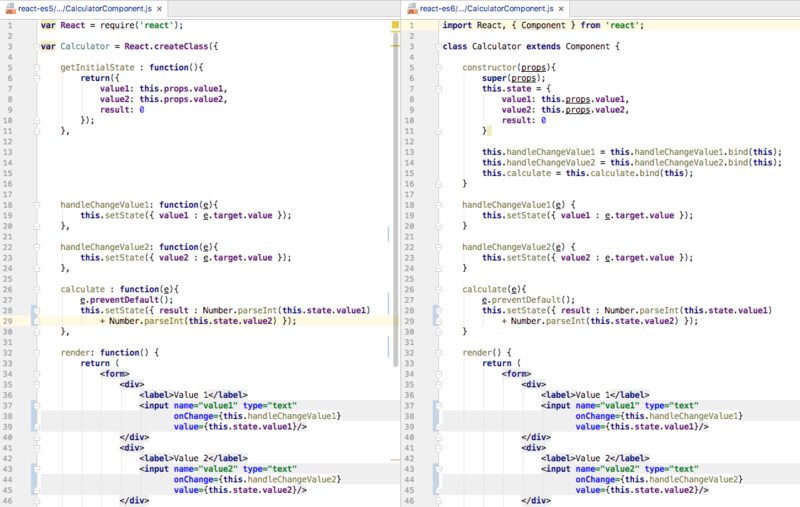 Defines component state using this.state in the constructor(). Exports the component as a module using the export default. The render() function is similar in both. Implicit binding of "this" to functions. Props are passed into the component via the constructor(). Explicit binding of "this" to functions in the constructor, using this.functionname.bind(this). And that’s it! I hope this is a useful reference if you’re looking for a side-by-side comparison. You can clone my example apps from GitHub here. I’m still learning as I go. If I’ve misunderstood anything or got anything wrong, please leave a comment and let me know!